A solemn sonic atmosphere, reminding of the clang of an organ, lingers among the trees. Inside the little chapel you can hear a man reading a text, but the house is empty. Apart from an opened book on a table, and some lonely light bulbs hanging from the ceiling, there are no signs of residents. You can not enter the house. Permanent exhibition at Wanås Art, 2000 and forward. 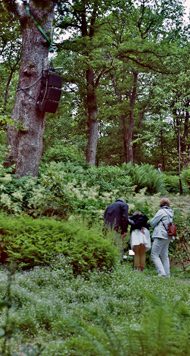 Sound installations in green environments offers exciting contrasts, discoveries and surprises.